Eleuthera is a tiny isle known as one of the prettiest island of the Bahamas. Its name is derived from a Greek word meaning freedom and is pronounced “ee-loo-thrah”. Sometimes it’s name is also shortened into “lutra”. The island was founded in the mid 17th Century by a group of Puritans who sailed south from Bermuda in search of religious freedom (read more information about the history of the Bahamas). Eleuthera is a small archipelago itself since it counts three main islands: Eleuthera mainland, Harbour Island (the famous cay off the north coast) and Spanish Wells. Although it is only an hour from Florida, Eleuthera is not developed and it is different from other Out Islands in the Bahamas for a number a reasons. First of all it is very quiet since there are no nightclubs or casinos or crowded places. Therefore is the right place for who is searching for natural treasures of people, beaches and sea and is not looking for 5 star hotels and first class service. In “lutra” you will find desert beaches and an ocean with countless variation of blue, emerald and turquoise. The island is also quite hilly. The topographical feature allows for houses to be built into the hills, and give great views, as in the case of our cottage. The island is 100 miles long, and only a few miles wide. It narrows to about only 100ft at the well known Glass Window bridge near Gregory Town. Since the island is so narrow you can easily visit beaches on both the Atlantic and Caribbean side on the same day! Beaches on the Atlantic side are best for sunrises, snorkeling, pink sand and surfing. The Atlantic side is also windier during rough weather. We recommend Twin Cove beach, French Leave beach (a.k.a. Club Med beach), Poponi beach, Double Bay beach and Winding Bay beach on the Atlantic coastline. The Caribbean side is easier to get to and features calmer waves, shallower and warmer water, sandy bottoms. On this side a must see are Twin Sisters beach, Gaulding Cay beach, Rainbow Bay beach, Alabaster bay, Ten Bay beach. We also suggest visiting Ben Bay in Northern Eleuthera and Lighthouse beach at the southernmost tip of the island. But …it would be just your choice since both sides are really beautiful! 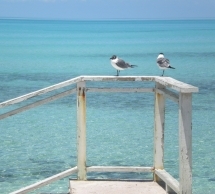 Visit this page to find out how to get to Eleuthera Bahamas.